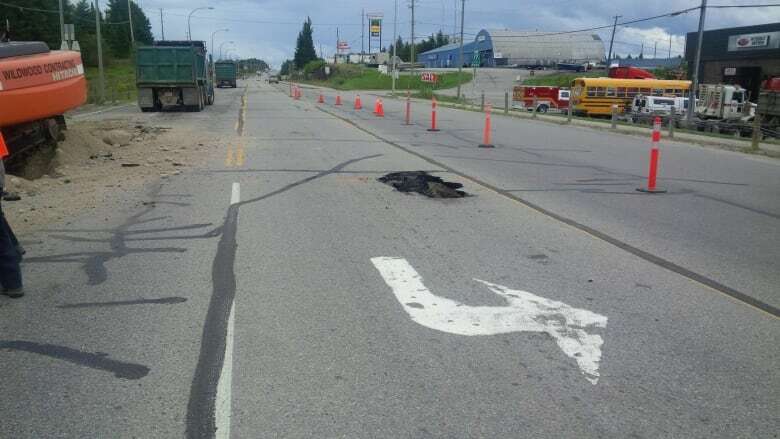 The city of Dryden, Ont., continues cleanup efforts in the wake of heavy flooding brought on by a Friday afternoon thunderstorm. Dryden Mayor Greg Wilson said about 50 private homes were heavily flooded, and several roads were closed over the weekend, largely due to debris clogging culverts and forcing water up over the roadway. "The concern is with so much water having fallen that, with the soil being soft, you never know what else might give away," Wilson said. "So, even though it seems that the worst has passed, you still have to be on guard." The storm that led to the flooding hit the city on Friday afternoon, said Arnold Ashton, a severe weather meteorologist with Environment Canada. "The incredible thing with this event was that it was so localized it just happened to span the entire town," he said. "Literally four kilometres, and it was pretty stationary." "It had a very small catchment area, so if this was, say, five kilometres to the south or to the north. This would be not even a news story, and nobody would know about it." Social media was full of photos of flooded streets, submerged vehicles and sinkholes. According to the Dryden Police Service, Friday's storm caused several Dryden road closures, including Gordon Road, Highway 601 North to Thiel Road/Leach Road, and one lane on both Thiel Road and Olsen's Landing Road. The status of the closed roads was not immediately available on Sunday. The King Street Underpass was also closed; repairs were expected to be completed by Monday. "At the underpass, the problem we had was with the ... train trestle, the giveaway of the track bed underneath," Wilson said. "CP, they jumped on it really quickly, but all of that soil, all of that gravel and so on, it had to go somewhere and it ended up clogging one of the key drains into the Wabigoon River, so that caused all sorts of backup." A small sinkhole also formed in one of the highways leading into the city, Wilson said. A truck became briefly stuck in the sinkhole, but was hauled out by a tow truck. Most of the flooded roads had been reopened by Sunday, Wilson said. There were no reports of injuries, and Dryden opened its landfill site on Sunday to help with cleanup efforts. Wilson said that at least 50 homes in the city were heavily damaged by the flooding. "There was one lady I talked to outside her house — she was sitting in her lawn chair having water pumped out of her basement — who just said that within a few minutes water crashed through her basement window," Wilson said. "This poor family, they're not going to be in their house for quite a while, it's quite the mess." "She said that in her basement, there was seven feet (2 metres) of water." "Union Gas is asking residents and businesses not to attempt to relight natural gas appliances on their own. If equipment has been submerged in water or affected by the flooding in any way, they will need to be inspected by a licensed gas technician or heating contractor before being reactivated. "Union Gas representatives are available to inspect and repair gas meters and regulator sets if required at no charge." If residents think a gas leak might be taking place, they are instructed to prevent any source of ignition, exit the affected building and call Union Gas at 1-877-969-0999 from a safe area. Ashton said Environment Canada's own weather station in the city recorded 23 millimetres of rain falling in Friday's storm. However, home-based weather station recordings from the same period told different stories. One such private station recorded 109 millimetres and another 152 millimetres, while others showed 50 or 30 millimetres of rain fell on Dryden Friday afternoon. The discrepancy, Ashton said, is due to the nature of the storm. "It's the size of the storm," he said. "If you're three blocks over, you may not get anything versus the guy who got 150 millimetres. It's incredible. That's just the way these storms are — they can be very small and localized." Ashton added there is more rain in the forecast for Dryden over the next week, but "nothing major" is expected.